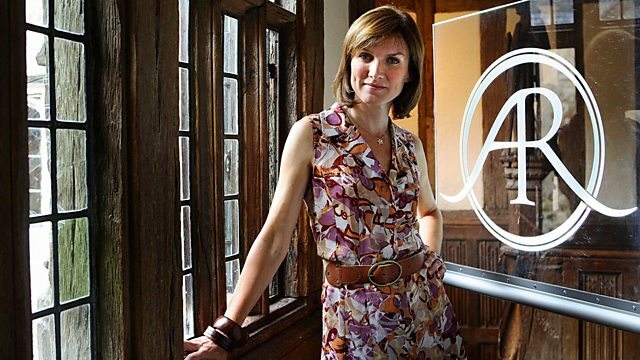 Fiona Bruce and the team of experts visit Aberystwyth Arts Centre in Wales. Browse content similar to Aberystwyth University 1. Check below for episodes and series from the same categories and more! This week, the Roadshow comes from a town on the edge of Cardigan Bay. It was known in the 1920s as the "Biarritz of Wales". Welcome to the Antiques Roadshow from Aberystwyth. for the Victorians who liked to come here and dip their toes in the sea. show off their fashionable clothes, and take the air. and awarded the contract of forging a rail link to Aberystwyth. the day the town celebrated the official opening of its new railway line. pulled up to Aberystwyth station. by coming here and kicking the bar. I don't know why. It seems a funny thing to do. But I've seen people do it and, apparently, it brings good luck. as we join our experts at Aberystwyth Arts Centre at the university campus. I said to her, "The one thing I would really like to see tomorrow is a spoon rack." -"I've got somebody you must meet." And here you are! How far back can you remember them in your family? so that would be my great-great-great grandfather. So that takes us almost back to the beginning of the 1800s. -That was in a little village called Llanfihangel ar Arth. I'm glad you said that and not me! In the north of Carmarthenshire, really, still in Carmarthenshire. -And were they in a farmhouse? What they used to call a longhouse. One main room, one bedroom, with a bedroom door leading into the cowshed. -And these would have hung on the wall? And tell me how they were used? They were used for what, in the Welsh was called cawl, which is broth. Put a big pan on the fire, open fire. and last, before serving it, the leeks. I bet it was one of those dishes that, when you had it the second day, it tasted even better. Oh, much, much nicer, much nicer. But what I love about this is that it is a design, a shape, that has never changed. it would have been looking just the same in the 1880s. sort of lovely blackness over it, which must have been from the smoke. and they would have just been simply carved, wouldn't they? -Whittled away in the evening. children round a table, they just are a dream. -You can picture it, can't you? -So how long ago were they last used? I think they were last used in 1986. -I think Health and Safety might have something to say about it now. I can't tell you how thrilled I am to see them, and so many spoons. I mean, to me, they are as rare as hen's teeth these days. -They will be passed down. ..generation to generation. So how often do they come to market? Why would anybody want to sell them? -A group of tiny toys. They belong to me now. They were my father's. He had them from a very early age. I presume they came from his father. in a little case for ages. Well, that's lovely that they're family things. I hope you can understand what I'm saying, I've got a terrible voice - I'm losing it. -Anyway, do you know what they're called? -by street vendors, with a tray out, for a penny a go. for a gross, which is 144 items. -So, you know, it was a good little money earner. And they had no overheads other than their tray. as their first introduction to tin plate toys. and there is nothing on these to indicate where they were made. knew that, you'd be able to put two and two together and make it work. here - for instance - is a London bus with London destinations on it. -companies were making things to appeal to particular markets. Well, there were three big makers. one was a company called Fischer and the other one was Meier. All three companies are represented here, I'm sure. -so that fits in well with your father's father. an awful lot of work went into these. -but they do have movement, don't they? the wheels then rub against the turning axle and move it forward. I mean, it's so simple. -actually bought them from one of those street vendors for a penny a go. Oh, I really don't know. Late 1800s. -Well, then it could easily be, couldn't it? What a great idea, that this has come straight from that street vendor. -Well, I have to say that these are sought after today. -..and some are worth considerably more. No! No, you're - no, really? No, see I knew you were telling me fibs! They're little things - they're not going to be worth much. -And they're in rubbish condition. -What! Oh, get me a seat. -So do I say that they're "pennies from heaven"? They certainly are! I hope my dad's watching today. "or has someone in your past, been captain of this boat?" My grandfather's brother was the captain of this ship. -And so was your grandfather's brother David Jones? that was the captain of this boat, and it's still in the family. and then David Jones, 1861, so that's when he was being captain. Italian painter of boats in the mid 19th century, doing it for captains. which is a form of watercolour, thick watercolour. And this picture is in quite good condition. the back through the pine backing. But it's just fantastic because it's so original. this angry sea under the ship. It's marvellous, actually. What is a picture like that worth with that provenance? in a marine auction, it would make at least £2,000 to £3,000. Mmh, quite surprised. Very surprised, actually. saying "my travels" must hide a photograph album, I'm guessing. and when he retired from the Indian Army - he was a Major General in the Indian Army. -so he lived out there his whole life actually, and died out there. -Really? Let's have a look inside. Here we have an ownership inscription. "WE Marshall, Major General, September 1887". -Now we start with a route map. which I guess was done by your relative. but maybe he didn't know where he was going to go. then he went all through Ledakh all the way up here to Lei which is just in Southern Tibet. and a photograph of him, taken by himself just after his return. Yeah, one year older than me, and he looks a lot worse! I think they must have been some travels. Well, that is a nice start. Let's have a little look further through. He's captioned all the photographs and most of them are by him. Isn't that a wonderful group shot? but very historical as well. Now if we move on. what they were going to do with them, so this is not just a one-man expedition. Did he publish at the end of all this? He did write a book later on about his life with a Southern Indian tribe. -Right, right, so this was sort of preliminary work. -he seemed to have a real respect for the local people. and really nicely taken. Look at those children. which is a really key factor in value. Without the captions, we wouldn't know half as much as we do know about it. So many albums like this have been split up and destroyed. -I think stands for at least half of its value. So, what are you going to do with it? Will you keep it, sell it? I'm going to keep it - if you tell me it's worth a fortune, maybe not. But I'm hoping it isn't. Well, this is - this sort of thing is very desirable. and I just love the whole package. So I'm going to suggest an auction value of between £5,000 and £7,000. -Excellent, lovely. We'll still keep it! If it wasn't for this, we'd probably all be speaking French now. probably the most iconic weapon the British Army's ever had. Brown Bess - do you know why it's called the Brown Bess? which is the military stamp. We've got something interesting on the stock. Private Cracroft would still be doing guard duty in 2011. So I think this is a militia one. Of course, the most iconic battle this was fought with was Waterloo. -Do you think it would be in Waterloo? -This one unfortunately wouldn't have been. that's what the army were issued with, and that was Waterloo. which you really don't want to collect on the other end of it. Flintlock, as we can see here, operates like that. ignites the powder in the pan, burns through into the touch hole. Everything loads from the muzzle end. A good man can get three shots off in a minute with one of these. but this one is probably about 1800. Where did you obtain it from? It's always been on the mantel in my house - my mum's house. in Nottinghamshire in the 1950s somewhere. Excellent buy. I'm glad it's on display - they should be. you wouldn't get it at your flea market. -and that's going to cost you £1,000. It's very nice and I hope it goes back on the mantelpiece. It belongs to my one-year-old son, so it's his heirloom. What a very lucky little lad. I wish somebody had given me a Brown Bess when I was one. -Thanks for bringing it in, it's great. It doesn't look like your most prized possession. -It hasn't had a lot of care and attention. No, it's been in the garage for the past 20 years. Do you know where it comes from? Any ideas at all? and that's all the history I know actually. -that it's a Welsh chair. -It's half a Welsh chair. six of the six splats off. It would have stood up like that with a nice combed back on the top. -So you could lean back and relax. That's gone. So you might have devalued it a bit, I think. -it is actually in three pieces, that's typical of Wales. -because it is only half a chair and it's filthy dirty. You see how high the arms are? Yes. That is typical of the Celtic tradition. -Scotland, Wales and even the West Country, Cornwall. Had these... Seemed to have these high arm chairs. why do you need the arms high? Probably to keep them out of the soot. and that helps you see what you're doing or reading. -So I'm sure that's why. but I won't because I think it's fascinating. -But what I'd like to do is have your permission to do something. -It's not worth a lot like this, but can I polish? -Because I just happen to have some with me. Whoops. So here we go. You realise you're going to have to finish this now? the Royal Wedding of Charles and Diana on television. But you have a very different experience. Clearly you were part of it. we didn't know where we were going to go on honeymoon. coming out of Gibraltar, that's when we knew where we were going. So you were serving on board the Royal Yacht Britannia? a very private affair in many ways, where they could escape almost. Well, that's what the yacht was about. It gave the Royal Family some privacy. on board in normal clothing like ourselves, you know. Just a sloppy jumper and a pair of jeans. in this incredible collection of photographs. You were responsible for what on board? I was a PTI, the physical training instructor. So I was basically keeping everybody fit. some of the entertainment and a little bit of security. and a head of Charles watching a show over here. It was a tug of war scene. There's a wonderful photograph here. I think you're serving drinks. Yes, I had the honour, yes. You're asking her what she wants to drink. What did she drink? Well, actually she had a shandy. Yes, she was, and Charles had his boring orange. -But he wasn't boring on board? He was always involved in activities. He was a bit of a sportsman. We used to call him "Crazy Horse"
because he was like a bull in a china shop. If he was playing hockey, you got out the way. Oh. And they went swimming? Yes. We stopped in the Med. and she was also one of those in the water. but they're obviously very personal, intimate photographs. -and then you're allowed to purchase some of them. on the way we look back at that marriage now. £700 or £800 as an album. so we'll be keeping them. You got them to have the best honeymoon ever. See how well this is coming up. This lovely red paint underneath. -but almost certainly the seat will be elm. which would be more typical of a Welsh chair. and these front ones with the bamboo and legs. making for somebody within probably very near to Aberystwyth. We just don't know, we don't know who it was. When was he making this? -I would have thought the end of the 18th century? Slightly older than I thought. something like that. 230 0r 240 years old. Very little, I'm afraid. I'd probably pay you £200 for it anyway. Oh right, it's interesting knowing the age and the value. If you'd clean it up. Finish the job. and makes it significant and valuable. The thing is, how do you tell? a bit of a challenge - basic, better, best. This week is the turn of our arms and militaria expert, Graham Lay. and then there's the best, worth £4,000 to £5,000. but Graham is going to reveal all later on. First it's time for our visitors and you to see if you can work out which is which. -Have you any idea what you're looking for? This is a trick question. The smallest one will be most valuable. What do you think? Basic, better, best. Here would be basic that one would be better, that would be the best. -That one and that one look very similar, don't they? OK, I'm going say better and best. Crosses there, and crosses generally say more important. -That could be the best. -Why do you think that? These ones are the most important ones. Hold on, switch those around. -Sure as I can be. Now this is a striking bit of human anatomy. Well, it's quite a story. he gets in touch with me and he says, "Are you interested in buying?" Francis Bacon and recognised the signature and we did a deal. Of course the central question is "Is this by Francis Bacon?" in the last 20-30 years, died fairly recently. so it's really worth getting this one right. all the sort of stuff that you associate with Francis Bacon. -Let's have a look at the back, shall we? will tell you more than the front. "A gift to my sister." at the top here that says "Francis Bacon B29". but what do you think the B29 refers to? perhaps it's the Hanover Gallery Exhibition number of 1952.
in the life of Francis Bacon. You could say we're warming up. But then, does that look really old? Or does it look like a photocopy of a label? And is this B29? Is the paper just a little bit fresh? I'm not sure. But let's just ask those questions. where it would do, with damp. But the signature looks to me to be genuine because it's spontaneous. And I'm going to just go back to the front. Someone has gone to inordinate trouble to get it right. that Francis Bacon might have done. or auctioneers would be taken in. Someone around us, who knows? -and has done it quite well. And don't worry, you are not alone. I've even been taken in myself. Yes. It's all part of learning, isn't it? Forgive me for saying, but that's an extremely striking design, it really is. Beautiful, isn't it? I have a brooch in here for you to have a look at. -Wondering if you could tell me anything about it. and the rather sweet demure little chick here. Would you not agree? -I thought they'd go well together. -What's the story behind it? -and that's about all we know about it. -Well, they are chipped diamonds. In fact, it's what we call rose diamonds. in little novelty brooches like this. Would you not agree it is novelty through and through? and little cats and dogs and whatever it may be. is very nicely modelled and there's the egg and the shell. It's broken, the top of it's off and there's the chick. Isn't it sweet? -or a sapphire in the eye. -put a little stone in, just give it that bit of colour contrast. -Worth doing, it really is. I don't. My mother used to and it will be handed down to me and then I will wear it. OK, OK. Value. Well, substantial? brings an object that you've never seen before. I thought, "What is it?" It soon becomes apparent. It's a coin sorting device. A sovereign weighing machine. but I want you to tell me how you come to have such a unique-looking object. that they were presumably getting rid of and this was one of the things. And my brother and sisters had sort of nice copper brass scales, you know, and I got this. is that this was an obsolete item. And when did it become obsolete, when did he bring it home? Late '60s, '70s sometime. Can't remember exactly. That kind of makes sense. for manufacturing armaments, things like the Woolwich Arsenal. This is the category that this falls into. because they may have been clipped perhaps, or shaved. then shoots them off into the reject tray. because they're very close to the half sovereign size. and it's going to go one way or the other. -let's say that it didn't weigh the right amount. -It's come out of the reject. -it's a masterpiece, isn't it? -I think this was made for the Royal Mint. My father did do some work for the Royal Mint. He sort of got seconded to the Royal Mint or something. Let's think about trying to put a price on this. It's a difficult one. You brought in at the same time what I call a standard sovereign balance. and half sovereigns, to see again whether they were clipped or not. -Here's the Rolls Royce of sovereign balances. What have we got here? £29 or £30 worth. What have we got here? I think £700 to £1,000 worth. Didn't realise that at all. I just brought it along. I just find it interesting, you know. and a scarce piece of machinery. -I saw your lions this morning. Did they breed lions in Wales? -they've been away from home for the last hundred years. -This is their first time out? -And what about your lions? -Oh about the same, yes. So bred in Wales, but were they born in Wales? That's the question. -I think mine are English. Well, I'd like to think they're Celtic lions. Well... Mm... well I think you are absolutely right about yours. of the country potteries, probably in Staffordshire. or grab them by the tail. Dangerous thing to do with a lion! They've broken off, but they're still rather magnificent. -But that's only happened very recently. -it's actually Pill, which is a suburb of Newport. because I can't pronounce Welsh at all. but how would you pronounce that in Welsh? so these are the Pill Pottery from Newport in Wales. So yours are Welsh, yours are English. would have them prized on a table. Cottage, cottage lions shall we say? But you know, just as interesting. The value is because they're Welsh. Welsh people are very proud people, they want to collect Welsh things. Absolutely serious. I bet you're glad you let them out today. So it's the Welshness that counts? It's the Welshness that counts. and gained a medal should be enough. None of us really were quite sure what we were looking for. but people are interested in them. and almost everybody was entitled to a medal. so they were issued in huge numbers. is that they were always named. Gosh, so every single one of those millions were individually...? that can point you in the right direction for doing the research. So campaign medals, therefore, I assume are not that valuable. and depending on what the recipient did. And that's when we come to the Basic, Better, Best point of view. Right. Well, I'll tell you what I suggested. "everyone will have got one, so presumably not that valuable,"
so I put Basic here. I didn't know what to make of these. -time and again, about in Afghanistan or Iraq. and therefore I've put these in the Best category. Well, good, cos it doesn't happen very often! But looking at these - let's look at them first. This is the Basic group of three First World War medals. These are worth somewhere in the region of £60 to £80. and also this means "mentioned in dispatches". so he must have performed many acts of bravery. so he took part in some way, perhaps he was a Special Constable. And that's going to be worth somewhere in the region of £800. -I had a vague idea, I thought, "They're crosses." -But go on, cos I didn't really know. -Well, this is the important medal. because do you see this bar here? It means he was awarded it twice. -and so he was put up for it again. so he was awarded the bar to go with it. I think we should name him, if he was that courageous. "Captain John Williams, 15th Battalion Welsh Regiment." and the capture of many German guns and over 1,000 prisoners. And you found this out by researching his background? -He was a very, very brave and courageous man. you have shown bravery by being on the field. and maybe you could pay us a visit. I have never ever seen an articulated horse before. -I must admit, nor have we, ever. -So tell me your story. I've known it all my life, it was at my aunt's house. "Take what you need, what you like,"
cos I love it, and I've been riding all my life. I really can't blame you. I think it is absolutely fantastic. "J Mayer & A. Fessler, Wien". Vienna, so was anybody in your family an artist? My aunt, who owned the horse, her father was an artist. -Right, well, there you have it. to show a student of art perspective, how an arm moves. And, I mean, even his ears move. I mean, it's just fantastic. It goes into two categories. if it was ever to come up for sale. Well, I don't think, quite honestly, it will be up for sale. It's worth a lot of money. I'm going to be quite cautious in my valuation. For the moment, I'm going to put £2,000 on it. Somewhat more than we thought, quite honestly. But I can see it, in a retail shop, with a much bigger price than that. would have been wonderful, wouldn't it? -Well, it would have been, but I didn't happen to think about it. I would have done so. -Yeah, you do get thirsty doing this. I've seen in a long while. There are so many wonderful features to it. It's not the standard thumb piece. but the way the handle is designed - wonderful. and this lovely faceting on the handle. -we've got the mark of one of my favourite goldsmiths. So one of the greatest of all time, a certain Mr David Willaume. tankards are things that they rarely made. -But boy, when they made a tankard, did they make a tankard. Oh, I'm so pleased about that. Absolutely super, and that cipher is just right for the date. -But, of course, what is the date? the 958 standard rather than the 925 standard. So it's better than sterling silver? but because he was so good, he did. My word, I'm pleased to hear that. Now, is it a family piece? No, no, no. I bought it about two years ago. So what did you pay for it? -Well, I have to say, I think you did very well. Oh, I'm pleased to hear that! £3,000, £4,000, I think, quite easily. My word. Why, that's delightful to hear. come to own a piece like this? My father bought it for my mother about 40 years ago. so I brought it up for her tonight. So why did he buy it for her? Was she particularly attracted to birds? -It was the sort of thing she really liked, yes. I don't know where he bought it. It's been in the family about 30 or 40 years now, I should imagine. OK, you don't have any idea what he paid for it? -Or where he might have bought it? you can add a little bit of revenue out of it, too. -And he starts moving his head and singing. He's a quiet one, he's quite silent. -It's late in the day. My mum used to put the penny in and he used to make more noise. So he loved your mother? Yeah, he did love my mum, I think. -He was happy when she was around. -Yes, I think so. Yeah. -as I'm sure he'll love your daughter as well. is covered inside, and I think he'll come up wonderfully bright. And quite snazzy, actually, when he's had a good bit of a clean. You'll hear him, he'll sing sweetly again. -and they were effectively a rich person's toy. They were for entertainment, you'd have them in a corner. -Like a cylinder music box. Wind it up, play a tune, and ha ha, everybody had a lovely time. They were made in France, often with Swiss movements. -Ah! There we are, then. -In need of a bit of repair. And I still think you're looking at around £2,000. -and he can sing once again with joy. Here's a picture that really does tell a story. I look at this, I see barrage balloons. and people digging in the background. Second World War and digging for victory. -Yes, yes, it is called Dig For Victory, yes. -And how did you get it? two oil paintings, two watercolours. I have an oil painting as well and my brother has an oil and a watercolour. which is Arthur Charles Shorthouse. I've hardly ever seen any work by him. and he lived up to the 1950s. but I don't care that I don't really know this artist. -Because it's such fantastic quality. and you know, it's almost as though it was done for a poster. Because there have been posters for digging for victory. people had to dig up their gardens and grow things because of shortage. it sort of tells a story. They look like, yes, hairs off his brushes. -Hairs off his paintbrushes, that's right. Well, I think he's an artist that is not hugely valuable. -But I look at this and I think the subject matter makes it valuable. and I think this would probably make - in auction - £1,000 to £1,500. Oh right, yes. Lovely, yes, thank you very much. wonderful array of Native North American beadwork. I am actually overcome by the sort of diversity, the richness of it. Tell me the background, why have you got it? in the early 1900s and he went there to work - he was a missionary. -He went over to work in a school over there. and then obviously I inherited it then. -he was in contact obviously with various tribes. -And so these are things he brought back. -To show how it had been. and also you can see some of them have been worn as well, by him. -that you can actually precisely time the event. -What have you got there? So here we have this intrepid man in his fur coat. -Over there, yes, at the time. -Do you know much about him? Not an awful lot, no. Unfortunately, my nana's passed away, so I don't... I obviously never met him. -So I don't know an awful lot about him as a person, no. This is a letter then, the date there, August 20th. -I mean obviously writing letters home. -but I'm sure it's full of interesting facts. he was miles away from everywhere, and therefore leading a very, very remote life. is obviously, by and large, these are things of that period. And a lot of this material can go back to much earlier dates. -The only thing that may well be earlier here are the gauntlets. -Those could go back into the 19th century. We've got typical beadwork styles. a lot of them were being made for people like him. -We've got - in a sense - the tourist element, the visitor element. were very much tourist minded by the makers. We've got pipes - traditional cut from stone type pipes. But the things that excite me most of all are these. -Now why do you think those are different? -I'm glad you say that. that only occurs in a certain region of Western Canada. -And they are totally the product of one tribe, the Haida tribe. -The Haidas actually sit on the world's resources of argillite. that are significant to the tribe. -So a piece like this is a wonderful piece of story-telling. -All the figures are symbolic and it is this smooth stone-like material. There's nothing like it in the world anywhere else. this is just completely exceptional. -So to see that is just sort of blowing my mind out. -and I have to say, quite a valuable collection. A pair of gauntlets like that is probably £500, £600, £700. The slippers are £200 to £400. so you've got probably £2,000 or £3,000 worth in the beadwork. -Come on to the argillite. -That's going to be £1,500 - £2,000. oh, between £2,000 and £3,000 - or even £4,000. So put it all together, you're getting towards £8,000 or £10,000. -So, he did you proud. Yes, he did. And my nana, yes, for keeping all the stuff. to have a really great piece of argillite on the Roadshow. -You've done it for me. -So thank you very much. whether they're going to see collections from halfway around the globe or just around the corner. It's been wonderful here at Aberystwyth Arts Centre. From all of the Roadshow team, until next time, bye-bye.